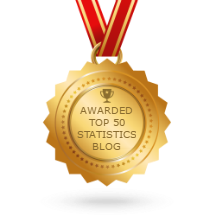 I finally took the time to read about axiomatic foundations of Bayesian statistics. I like axioms, I like Bayesians stats, so this was definitely going to be a pleasant opportunity to read some books, comfortably seated on the sofa I just added to my office. Moreover, my team in Lille includes supporters of Dempster-Shafer belief functions, another framework for uncertainty modelling and decision-making, so being precise on my own axioms was the best way to discuss more constructively with my colleagues. Long story short, I took the red pill: there is a significant gap between axiomatic constructions of the Bayesian paradigm and current Bayesian practice. None of this is new, but I had never been told. It’s not keeping me awake at night, but it’s bothering my office mates who cannot stop me blabbering about it over coffee. The good side is that smart people have thought about this in the past. Also, reading about this helped me understand some of the philosophical nuances between the thought processes of different Bayesians, say de Finettians vs. Jeffreysians. I will not attempt a survey in a blog post, nor do I feel to be knowledgeable enough for this, but I thought I could spare my office mates today and annoy Statisfaction’s readers for once. (being coherent) Ranking actions according to a preference relation that satisfies a few abstract properties that make intuitive sense for most applications, such as transitivity: if you prefer to and to , then you prefer to . Add to this a few structural axioms that impose constraints on on . Furthermore, there is a natural notion of conditional preference among actions that follows from Savage’s axioms. Taken together, these axioms give an operational definition of our “beliefs” that seems to match Bayesian practice. In particular, 1) our beliefs take the form of a probability measure –which depends on our utility–, 2) we should update these beliefs by conditioning probabilities, and 3) make decisions using expected utility with respect to our belief. This is undeniably beautiful. Not only does Savage avoid shaky arguments or interpretations by using your propensity to act to define your beliefs, but he also avoids using “extraneous probabilities”. By the latter I mean any axiom that artificially brings mathematical probability structures into the picture, such as “there exists an ideal Bernoulli coin”. But the devil is in the details. For instance, some of the less intuitive of Savage’s axioms require the set of states of the world to be uncountable and the utility bounded. Also, the measure is actually only required to be finitely additive, and it has to be defined on all subsets of the set of states of the world. Now-traditional notions like Lebesgue integration, -additivity, or -algebras do not appear. In particular, if you want to put a prior on the mean of a Gaussian that lives in , Savage says your prior should weight all subsets of the real line, so forget about using any probability measure that has a density with respect to the Lebesgue measure! Or, to paraphrase de Finetti, -additive probability does not exist. 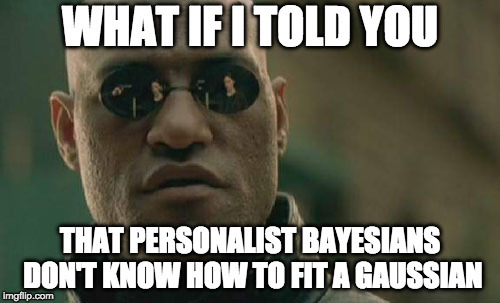 Man, before reading about axioms I thought “Haha, let’s see whether someone has actually worked out the technical details to justify Bayesian nonparametrics with expected utility, this must be technically tricky”; now I don’t even know how to fit the mean of a Gaussian anymore. Thank you, Morpheus-Savage. There are axiomatic ways around these shortcomings. From what I’ve read they all either include extraneous probabilities or rather artificial mathematical constructions. Extraneous probabilities lead to philosophically beautiful axioms and interpretations, see e.g. Chapter 2 of Bernardo and Smith (2000), and they can get you finite and countably finite sets of states of the world, for instance, whereas Savage’s axioms do not. Stronger versions also give you -additivity, see below. Loosely speaking, I understand extraneous probabilities as measuring uncertainty with respect to an ideal coin, similarly to measuring heat in degrees Celsius by comparing a physical system to freezing or boiling water. However, I find extraneous probability axioms harder to swallow than (most of) Savage’s axioms, and they involve accepting a more general notion of probability than personal propensity to act. If you want to bypass extraneous probability and still recover -additivity, you could follow Villegas (1964), and try to complete the state space so that well-behaved measures extend uniquely to -additive measures on a -algebra on this bigger set of states . Defining the extended involves sophisticated functional analysis, and requires to add potentially hard-to-intepret states of the world, so losing some of the interpretability of Savage’s construction. Authors of reference books seem reluctant to go in that direction: De Groot (1970), for instance, solves the issue by using a strong extraneous probability axiom that allows working in the original set with -additive beliefs. Bernardo & Smith use extraneous probabilities, but keep their measures finitely additive until the end of Chapter 2. Then they admit departing from axioms for practical purposes and define “generalized beliefs” in Chapter 3, defined on a -algebra of the original . Others seem to more readily accept the gap between axioms and practice, and look for a more pragmatic justification of the combined use of expected utility and countably additive probabilities. For instance, Robert (2007) introduces posterior expected utility, and then argues that it has desirable properties among decision-making frameworks, such as respecting the likelihood principle. This is unlike Savage’s approach, for whom the (or rather, a finitely additive version of the) likelihood principle is a consequence of the axioms. I think this is an interesting subtlelty. To conclude, I just wanted to share my excitement for having read some fascinating works on decision-theoretic axioms for Bayesian statistics. There still is some unresolved tension between having both an applicable and axiomatized Bayesian theory of belief. I would love this post to generate discussions, and help me understand the different thought processes behind each Bayesian being Bayesian (and each non-Bayesian being non-Bayesian). For instance, I had not realised how conceptually different the points of view in the reference books of Robert and Bernardo & Smith were. This definitely helped me understand (Xi’an) Robert’s short three answers to this post. If this has raised your interest, I will mention here a few complementary sources that I have found useful, ping me if you want more. Chapters 2 and 3 of Bernardo and Smith (2000) contain a detailed description of their set of axioms with extraneous probability, and they give great lists of pointers on thorny issues at the end of each chapter. A lighter read is Parmigiani and Inoue (2009), which I think is a great starting point, with emphasis on the main ideas of de Finetti, Ramsey, Savage, and Anscombe and Aumann, how they apply, and how they relate to each other, rather than the technical details. Technical details and exhaustive reviews of sets of axioms for subjective probability can be found in their references to Fishburn’s work, which I have found to be beautifully clear, rigorous and complete, although like many papers involving low-level set manipulations, the proofs sometimes feel like they are written for robots. But after all, a normative theory of rationality is maybe only meant for robots.